Groupon is one of the fastest growing companies that has ever existed and they now have an app that has been launched into the iTunes app store. This app will work on the iPod Touch as well as the iPhone and it will allow you to keep up to date with the daily deals that Groupon has. The app is extremely well designed and follows the Groupon branding well. It is intuitive to use too which is always a plus point. The Groupon app is available free of charge and it is a great way to keep informed of the daily deals. The app is divided into four different sections. The first section will show you the daily deals and will allow you to easily change the location if you want to explore other areas too. 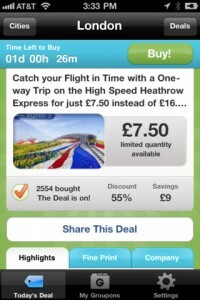 The second section will show shopping deals and the third section will show the Groupon Travel deals. there is also the fourth section of the app that will allow you to see the Groupon’s that you have purchased. You will easily be able to manage your subscriptions as well within the app, being able to change whether or not you get email alerts from Groupon rach day. This is really easy to change and can be done so with the click of a button. It is the same case for buying Groupon deals too which makes getting those daily deals as easy as it can possibly be.